So you’ve created the ticketing for your event and now wonder how best to share and begin sales? Here are the top 3 ways we recommend sharing when you own your branded ticketing software through Eventastic.com. Begin by signing into your branded ticketing platform using your custom URL which was created during your sign up process. Once signed in you can proceed to share using any or all of the following options. When you type your branded ticketing URL or share this URL through social media channels, emails, your website etc. the link will take you to your landing/search page as viewed in our example shown below. Any ticketing/registration event pages that have been created and clicked to be “public” (button at the top of your event page created) will appear as ‘cards’ on your landing page as viewed below. 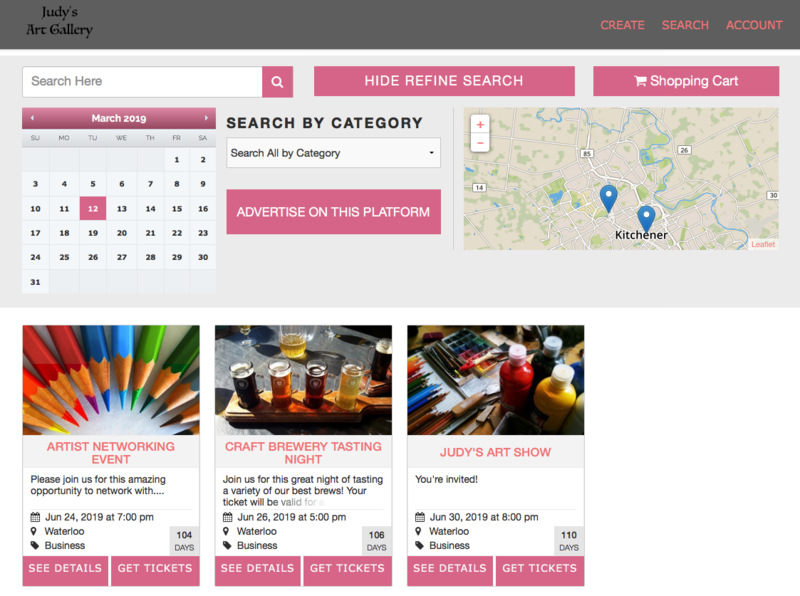 The more event pages, the more ‘cards’ appearing for people to click & view your offerings, buy tickets or register. You may already have an Events tab/button or a “What’s Happening” button on your business website which now may easily be linked to your branded ticketing Landing/Search Page URL for instances when you have multiple events or special dates to be announced. The shareable link to an event page created is found while in edit mode in “The Details” section of the page. Simply click the edit button and the popup appears displaying ‘Your Shareable Link’ which can be customized as you wish prior to beginning to sell the tickets. Simply copy and paste the sharable link to emails, social media channels, link to business website through a “Get Tickets Here” button, or “Register Here” button etc. and when a person clicks they will view the event page holding the tickets as created and make their purchases. A third option in sharing your ticketing or free registration for an event is by using the ‘Ticketing Kiosk’ which is auto-generated every time tickets are created on an event page. The Ticketing Kiosk is a window holding just the tickets you create with no other marketing features for the event. Many organizers will intersperse the use of the kiosk for instances where their business website already shows all the event details or through social media channels where you just want to display the ticket portion only when the link is clicked. The Ticket Kiosk is found when you click to ‘edit ticketing’ and scroll down to the button that reads “Online Ticket Kiosk”. Once clicked you will be presented with various options in using & sharing this kiosk link holding your tickets. A full description is provided on the popup that appears. For instance, you’ll be provided a link to be copied, pasted and used when wanting to share only your tickets on social media channels without sharing the full marketing event page you created. When this link is shared and clicked the viewer will only see the ticketing portion of the page for quick customer purchases. Hope this has been helpful. Please let us know if you have questions by emailing judy@eventastic.com. Thanksgiving is well known as the annual national holiday celebrating the fall harvest and for years we have gathered with family to share amazing meals of hot roasted turkey, dressing, mashed potatoes, gravy, squash, cranberry sauce and of course mom’s homemade pumpkin pie with whipped cream. YUM! I close my eyes and try to think about it hard enough so I can maybe start to smell the aromas wafting from the kitchen well in advance. 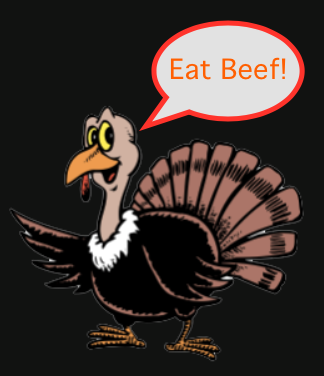 Why do we tend to only have turkey at Thanksgiving and Christmas? Mealtime gets quite animated in our household as relatives share the same fun stories over again from years past and of course we have a couple comedians at the table that like to challenge everyone with fun facts. This year I plan to be prepared with my own list of Thanksgiving Trivia Facts to share with everyone and as I made the list I thought I’d share them with you. Hopefully there is one or more out of the list you will enjoy sharing at your celebration. Thanksgiving in Canada goes back to 1578 in Newfoundland when explorer Martin Frobisher held a ceremony of gratitude for surviving the journey from Europe. Americans didn’t begin their annual Thanksgiving tradition until 1621 – 43 years later. “Cornucopia” is the Horn of Plenty; the symbol of abundance and nourishment. The wishbone is the forked bone between the turkey’s neck and breast and is classically saved, dried and snapped in two by two people as a superstitious good luck custom where whoever ends up holding the majority of the bone ‘gets their wish’. The average weight of an adult male turkey is 17 pounds. Current records with the NWTF show that the largest turkey harvested is 37.1 pounds. There are 17 ridges on a 14-ounce can of Ocean Spray Jellied Cranberry Sauce. There are 531 turkey farmers in Canada. 3.1 million whole turkeys were purchased by Canadians at Thanksgiving in 2014. Butterball says the best place to put the meat thermometer in the turkey is the thigh and should register at 165 degrees to ensure it is done. We at Eventastic wish you and your family a very happy Thanksgiving celebration and thank you for your ongoing support. We will continue to provide you with the latest online tools and technology to create, manage and promote your parties and events of any size around the world. There is no question how effective business mentorship programs can be to a business’ success. Businesses big and small encourage mentorship of employees to drive initiative, creativeness, sales and achieve goals. Attributes learned are often applied to other aspects of life. 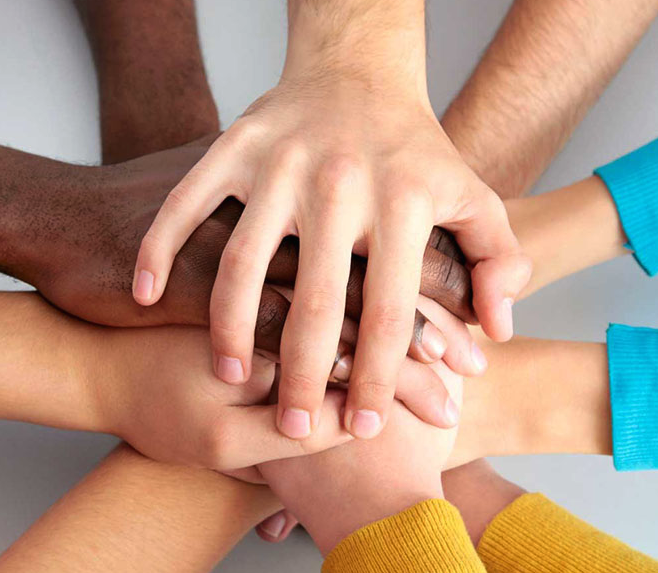 Creating and supporting community charity events is beneficial to all. Recently we were approached by local businessman Greg Boyd with his inspiring story and how he took what was learned through mentorship to the next level in giving back to his community. Read on for his inspiring story. I was on my way into my first big job interview back in 2009 – fresh out of school, this was a dream job (it was for IBM), and I had a 1 in 750 chance of landing it. I was nervous, but had confidence in my gameplan – my phone buzzed, and when I looked down, I saw that Martin, one of my first mentors in the business world, had sent me a message. It read “remember – impact, impact, impact”. He was retelling the same advice he’d given to me on my first day at IBM as an intern 3 years prior. Martin, a Senior Vice President at IBM shared with me that he had risen through the ranks by keeping his message sharp, always focused on impact when he spoke. That conversation started 3 years prior, and led to many others in that time, serving me well on my big day. Suffice to say, I got the job. Anyone who has been successful in the business world surely has a story like this – there is a long line of people to thank for successes, but not least of all are the many mentors who helped show the way. Waterloo Region has a blossoming entrepreneurial community due in large part to the successful journeys of few that has seeded the fortunes of many. The path was forged from entrepreneurs who learned hard lessons, and cared enough to invest in sharing them to the so-called ‘new guard’, planting the seeds of more success to come. Those of us who are a part of that community in our Region are fortunate to be a part of it. But some are not. Hundreds, if not thousands of our youth in Waterloo Region grow up with a full helping of potential, but no guiding force to help bring it to life. As a ‘Big’ at Big Brothers Big Sisters of Waterloo Region (BBBSWR), I saw first-hand amazing young men who had all the potential and hope in the world – they needed what I have been fortunate to receive throughout my life. They needed a Martin to invest in them – mentor them, and share their stories. BBBSWR does this work every day, creating opportunities for mentorship to happen for these young people, and truly transform their lives. They do this on extremely limited resources and tight budgets, and despite their best efforts, face a waiting list hundreds of names that may never enter their programs. They need our help. Greg along with Jen Forristal, Gary Abbott and Dave Inglis have come together to organize the event “Soirée in Support of BBBSWR”. Join them on Thursday, May 21st for Live Chef Demo (Chef Tom from Boathouse), Live Music, Open Bar (provided by Block 3 Brewing), and a Silent Auction all for a great cause to support Big Brothers Big Sisters of Waterloo Region. More than that, come share your story of the mentors who helped you get your start, and continue to build this great community. Tickets for this inspiring event can be purchased HERE. Thanks Greg for sharing and we wish you great success at your event! We encourage others inspired by your story to create community events as such and together we can all make a difference! Eventastic is an online solution for businesses or individuals everywhere making event registration and management streamlined and easier to administer. Whether it’s a conference, gala, fundraiser or sporting event, the platform provides an experience that can maximize success.